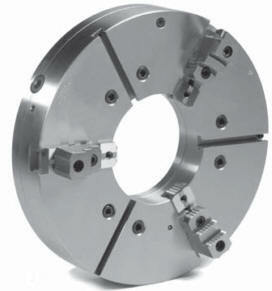 3-Jaw Self Centering Oil Country Chucks with Extra Large Thru-Holes. Forged Steel Body extra heavy duty chucks provide a high level of accuracy and extra high gripping power, rigidity, time tested reliability. For use on heavy duty lathes, indexers, rotary tables, and in a variety of milling applications. For extra heavy duty production applications. Chucks are provided with A type spindle nose mounts.